Ted Noten (born in 1956) is a Dutch jewellery designer and conceptual artist. His is known for his work of making acrylic handbags containing various symbolic items like stuffed mouse, guns, and fishes. I choose Ted Noten design, “A split before imploding ” which is one of 6 “jewelry bags” together called “limited edition” from 2007, from. 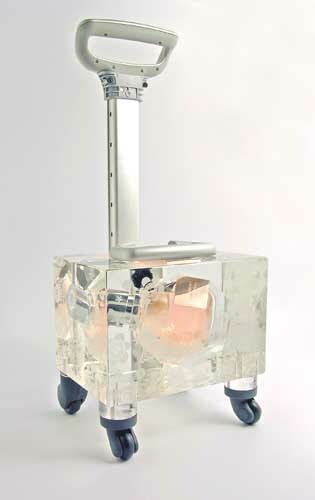 “A split before imploding” is a 30-kilo trolley bag made out of solid acrylic and carries only one item, a trapped perfume bottle (named Flower bomb) made by two fashion designers Viktor and Rolf. Ted Noten wants to deconstruct our preconceptions of jewelry and wanted to show how jewelry also can be implemented, without connecting it physical to the body. Ted Noten tells us that the trolley bag is a statement of “status and showing off” ….“The Fashion and jewelry worlds are absurd this bag’s 30 kilos -it would be ridiculous to carry”. The artist Marjan Boot also comments that the piece has a commentary toward predominant rise of wealth and the fear of robbery an it being in a trolley bag, tells something about the increased safety in airports and the fear for terror. I find Ted Noten’s “A split before imploding” interesting because of the visual design itself and the concept of the perfume bottle. This aesthetic of sealed beauty locked-in forever by impervious walls, tells a story about an idea of perfect beauty never to be introduced to the spotted and imperfect world. In Ted Noten’s work you often find some form of rebelliousness when it comes to him and his costumes. I find in his work “Pig bracelet” he made a golden bracelet with a small pig figure wearing a necklace. Giving the nature of this, being jewelry and highly expensive. one must assume that his costumers must have a reasonably good income. Having this in mind and seeing a pig wearing a necklace could indicate an ironic commentary toward his buyers as “rich greedy old woman” who are looking for beauty in all the wrong places. I would refer this statement also with the trolley. People buying a 30-kilo jewelry trolley with no practical means, could tell a story about the absurdity Ted Noten is trying to reveal. It seems that Ted Noten is often trying to bring forward the ugliness of mankind and then beautifully wrapping it in cellophane. You can see it in several of his works, like “Be nice to her, buy her a ring” a project in which clients to the red light district could buy a ring for 2.50 to give to a prostitutes and then hopefully a more respectable relationship between client and prostitute could be established. This is also seen in “limited edition” where one of the jewelry bags is a real gun inserted in acrylic and the cast like a schoolbag. This lethal gun represents the dark side of mankind’s destructive behavior and selfish power. But when covered in clear acrylic it distances itself from the lethal projection and becomes a symbol of raw power. His solid acrylic bag resembles a work I did a couple of years ago. 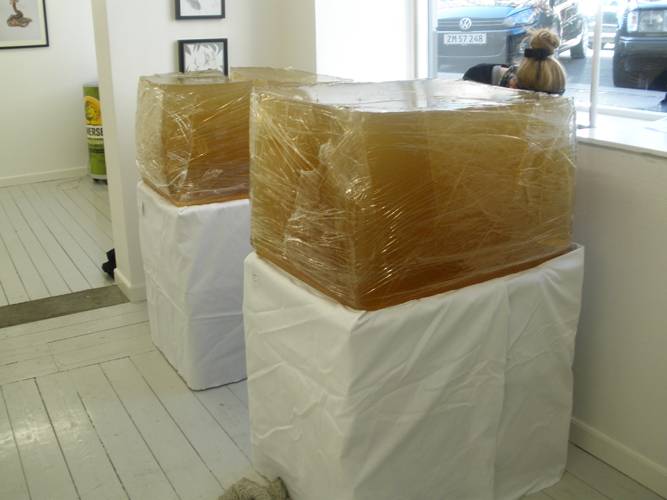 I made out of 500 kg ballistic gel, 2 square boxes containing a flower and a number of bullets shoot in from the side. 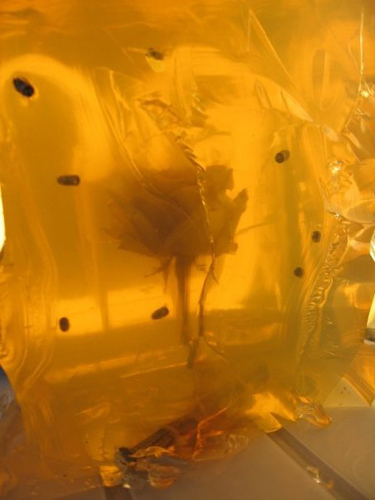 In my ballistic gel art piece. I’m trying to show the true competition that takes place during human conception. This is the competition for life. More the over 100.000 sperm fight for their ability to live on, but only one is allowed in, to fertilizer the egg. The gel is a tissue that to some extends resembles the soft environment that this conception is surrender of, but the gel creates an unbreakable and time free zone where nothing is allowed in. Also in Ted Noten’s work where this perfume bottles is captured in time and out of reach for anybody outside the hard visible box. I see him as an artist trying to tell a story of his surroundings either if it’s a mouse with a pearl necklace (Turbo princess 1995) or a giant bottle of perfume locked in acrylic. There is always of story about how we human most live with ugliness and beauty side by side. This time I looked for a book that would fit the previous two just as well as they fitted to each other. In connection to everyday life this book is about texture, colour and feeling of objects and scenes. It’s about the crackly sound of fabric, the smell of things, composition but also about life and death. It’s a book about modern still lives. The under title is Objects of Desire; and now thinking about it, it is not a bad choice at all. It fits perfectly with the first book because they both represent the normal ordinary things. It suits the second one mainly because it’s as serious as the reality of daily life. It’s definitely a representation of the world in every aspect. Maybe the only tag word that is not so obvious is ‘absurd’, though it’s really there, just on a more underlying surface; subtler I guess. Where in the fist book the absurdity of life is discussed in a very airily funny and positive approach, this books deals with the same theme, but in a very confronting real way. This book is about the things and facts of life as well. Most photographs are shocking and horrifying, but they tell the story of history since 1955. It’s a book about photojournalism. Despite all the nasty images there are also beautiful pictures included, some of famous photographers. Though there’s definitely a shadow hanging over this book and it’s called reality. The search for a book with the same tag words was pretty hard. I was exactly looking for the other more confronting realistic side of the absurd things in life. In the end I think this is really a book that suits exactly that subscription and therefore the same tag words as my previous one. I think it‘s his serious brother. Walking around the library, I laid my eyes on a book I saw last night at a friend’s house too. The book appeared to me a couple of times in my life before and I always absolutely loved it when glancing through. I knew this was my book. In a way it represents my interpretation of the world as I see it around me. The book is about being special in an ordinary way. It’s about objects just lying around at your grandparent’s house or things you see in other countries. This book represents designed, handmade and mass-produced objects. The extra ordinary yet normal stuff, from all around the world, showed in a funny absurd way. What’s normal for one is very odd for the other, and so a lot of what’s in the book looks pretty weird to me. It makes you wonder… Are the items in my life normal?